Treadmills are great for beginning as well as experienced runners. You can program a treadmill for hill and speed work, and it offers a cushioned surface that minimizes impact on joints. 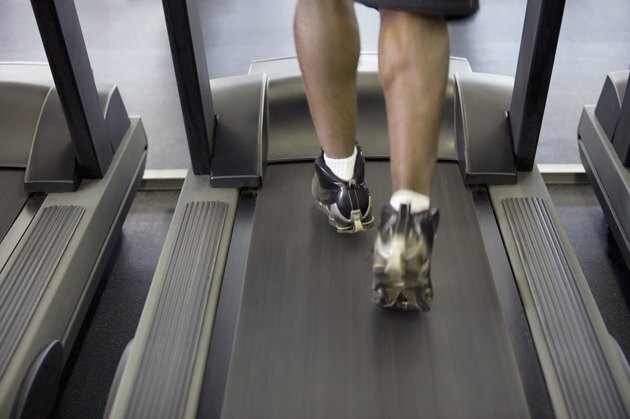 Weather factors like excessive heat, wind and cold don't affect treadmill workouts. Choosing the correct combination of speed, time and incline will get a beginner onto a solid base for one of the best forms of cardiovascular conditioning. Running on a treadmill at zero incline is the least amount of work. Adding a slight incline makes the leg muscles and heart work harder. The difference between a fast walk and running starts at about 4.5 mph. For a good beginner workout, warm up by walking at 2.5 mph for five minutes at 5 percent incline, then run at 5 mph for five minutes at a zero incline. Cool down to a walk at 3 mph for five minutes. Interval training means getting out of the comfort zone. For most runners, the "talk test" indicates how hard they're working. Being able to carry on a conversation while running on the treadmill means the effort is sustainable for a longer duration. Running faster intervals makes it hard to say more than a word or two. For example, a beginner could run and talk at 5 mph, but not at 6.5 mph. Long, steady runs have an advantage on the treadmill, as you can listen to music, read a magazine or watch television while running in place. A three mile or longer run at 5 to 6 mph indoors prepares you for longer outdoor runs. It will take beginners at least 22 to 36 minutes to complete the distance. After running on the treadmill, stretch your hips, calves and quadriceps. Runners should also perform core strengthening exercises to keep good posture while running. For example, you can do crunches, bicycle kicks and pushups on a mat right after running on the treadmill. Do a set of eight to 10 repetitions of each exercise several times per week.